Business model innovation: what can we learn from Zara, and where do Nestlé´s Nespresso and P&G´s Crest Whitestrips fit in? There are two basic types of innovation and of innovation management which we typically distinguish: Innovations within the existing business model: Nintendo´s Wii is an example of this type of innovation. It is a typical (radical) product innovation within an existing business model. Innovation through a new business model: Zara is an excellent example. Which are the most innovative companies in the world? The Innovation Survey by Boston Consulting Group attempts to provide an answer. Ten companies are named the leading innovators: Apple, Google, Toyota, GE, Microsoft, Procter & Gamble, 3M, Walt Disney, IBM and Sony. What can we learn from these innovation leaders in respect of their global innovation management? • Cost and efficiency benefits of scale and specialization: this argues for a greater centralization of innovation management and R&D management. Centralization creates the critical mass to generate economies of scale from, for instance, the purchase of expensive and specialized laboratories or to draw specialization benefits from the recruitment of expert professionals. Centralized innovation management often appears under monikers such as “Centres of Innovation”, “Centres of Excellence” or “Chief Innovation Officer”. • Efficacy benefits and better market exploitation: this speaks for a delegation of the innovation task to decentralized business units, and for a lean configuration of the central innovation organization. The proximity to , for instance, the market and to the customers generally enables the decentralized parts of the business to better and earlier detect emerging market opportunities and to exploit them more fully. Prerequisite for this organization is, of course, that the findings of the decentralized business units are quickly communicated to the headquarters and shared with the rest of the corporation so that top management and the rest of the corporation can learn from them, quickly respond to them and, in particular, prevent being pre-empted with an innovation idea by competition in other parts of the world. The idea of ​​decentralizing innovation management is, of course, also founded in the basic philosophy that companies can only develop a really innovation-conducive corporate culture if innovation is not solely the responsibility of a special department in the corporation but the responsibility of all employees. Otherwise the risk is too great that the stream of new innovations within the company becomes too narrow and that the business units use the inadequate supply of innovations from the central innovation department as the perfect excuse for an unsatisfactory business performance. 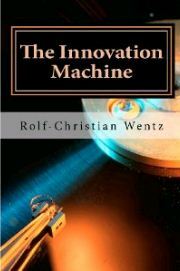 Companies like 3M and Google have therefore delegated the responsibility for innovation to the organization at large. 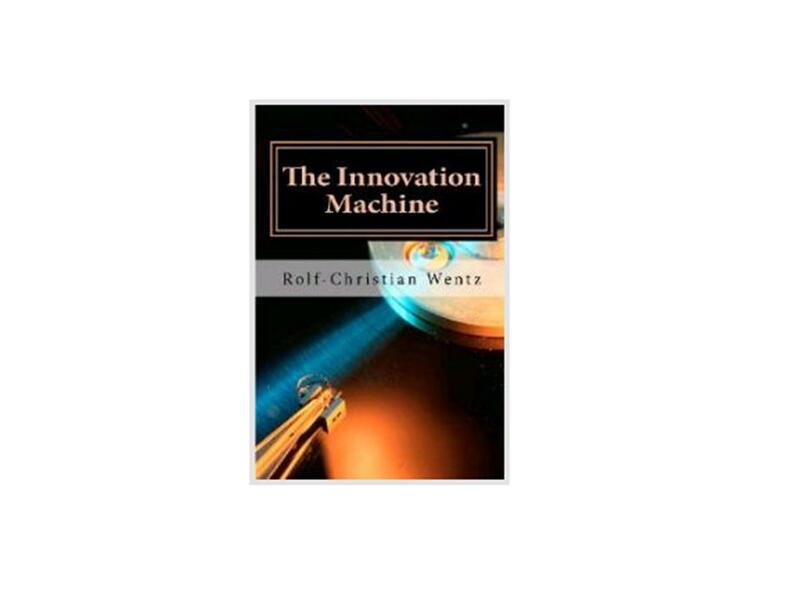 They understand that innovation is governed by the law of large numbers (Peters and Waterman 2004): like a venture capitalist, a company needs a large number of good ideas in order to distil from them a few game-changing ventures. That is why at 3M basically everyone, regardless of whether he or she works in a technical department or in a non-technical function, is called upon to contribute to 3M’s business success with innovations (Gundling 2000). The above arguments often speak for a hybrid organizational structure of innovation management. At P&G, for instance, where nowadays innovations are generally managed worldwide and centrally out of the Global Business Units (GBU), a big market such as China has a high degree of autonomy in innovation management due to the special demands and opportunities of this huge market. GE, within its global innovation management structure, grants its Indian business a high degree of autonomy. Apart from the general reasons speaking for a centralization of innovation management, there is the particular issue of managing and protecting disruptive innovations which argues for centralization. 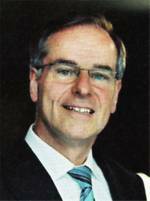 As IBM´s CEO Gerstner said so well: “The new ventures had to be protected from the normal budgetary cycle because if things get tight, more often than not, profit-center managers would be tempted to starve the future-oriented projects” (Gerstner 2002). it. The emerging business opportunity is physically located within the “host” division in order to facilitate the access to the division´s resources. Each leader of an emerging business opportunity has a dual reporting line. 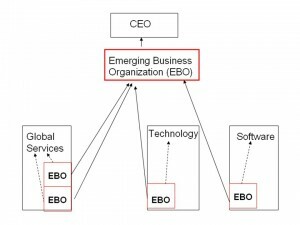 On one hand, he reports to the head of the central Emerging Business Organization (EBO), as indicated by the continuous line. On the other hand he reports via a dotted line to an IBM business head, such as the Senior Vice President of the IBM Technology Group, the Senior Vice President of IBM Global Services or the Senior Vice President of IBM Software Group. For similar reasons, P&G has instituted a centralized management of radical and disruptive innovations by its “Future Works” organization. This figure depicts how radical and disruptive innovations are handled at P&G (Leifer et al. 2000): ideas come up from the bottom of the organization in two ways. Either they originate within the existing business units. In this case they are to be presented to and approved by the Corporate New Business Development Group (CNBD), which can seed-fund these ideas. Or they originate from within the corporate R&D organization: in this case the ideas are to be submitted first to the Global Technology Council (GTC) for a technological assessment. The GTC itself is also authorized to seed-fund such radical or disruptive innovation ideas. 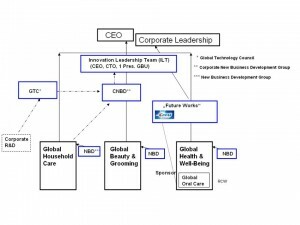 If these technological innovations are qualified in the seed phase, in a next step they need to be vetted by the CNBD for their commercial potential before then being presented for approval to the Innovation Leadership Team (ILT), which consists of P&G´s CEO, CTO, and a president of one of its Global Business Units. Similarly, radical or disruptive innovation ideas conceived in the business units are submitted to the ILT. If the ILT approves an idea, it delegates the management of this radical or disruptive innovation idea in its initial phase to “Future Works”, which is run by a General Manager and houses various multi-disciplinary teams (Lafley, Charan 2008). Lately, “Future Works” has received the mission to largely focus on enabling new business models (Brown, Anthony 2011). From the kick-off of a radical or disruptive innovation project, at P&G, too, a “sponsor” in one of the existing Global Business Units is assigned to the innovation because P&G believes that for the ultimate success of the “Future Works” projects it is of critical importance that projects have a “home” and a “nurturing sponsor” in the existing business units. Crest Whitestrips, for instance, had the global oral care business unit as its sponsor. The respective leader of the existing business unit will ultimately take over the responsibility for successfully commercializing an innovation after the “Future Works” team has qualified the initial product prototype, and has established the market potential of the breakthrough idea. Gundling E (2000) The 3M Way To Innovation. Balancing People and Profit. Kodansha International, Tokyo et al. Innovations within the existing business model: Nintendo´s Wii is an example of this type of innovation. It is a typical (radical) product innovation within an existing business model. Innovation through a new business model: Zara is an excellent example. To launch innovations faster and still successfully. That is the objective of Fast Innovation. For this the customer must be understood in depth. Kimberly-Clark, the Innovation Machine Procter & Gamble, Pepsi Co. and General Mills demonstrate which innovative methods help in discovering consumer insights faster. In their innovation management they make use of a Virtual Store. How much is it worth to you understanding your customers? One billion US$ ? The innovation machine P&G responds to this question with a resounding “yes”. Since 2001 P&G has been investing more than one billion US$ in a better customer understanding and in improved consumer insights.